Episode 6 from the brand new Amy’s Aviation series is here! 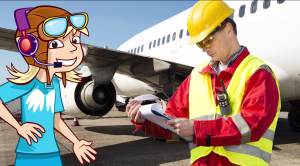 In this episode we’re learning all about how a pilot controls a plane. Old planes use mechanical cables and levers to connect the controls to the wings, flaps and ailerons. But newer planes use something called ‘Fly By Wire’ which uses electronic signals and computers!